Located in Zakynthos, Denise Beach Hotel is on the beach, within a 5-minute walk of National Marine Park of Zakynthos and Agios Sostis Beach. Featured amenities include a 24-hour front desk, luggage storage, and a safe deposit box at the front desk. Free self parking is available onsite. When you stay at Meroi Studios in Skiros, you'll be near the beach and 6 minutes by car from Brooke Square. Free self parking is available onsite. When you stay at Porto Heli Apartments in Sitia, you'll be near the beach, within a 15-minute drive of Vai Palm Grove and Toplou Monastery. Free self parking is available onsite. When you stay at Markos Studios in Thasos, you'll be near the beach, within a 15-minute walk of Potos Beach and Pefkari Beach. Free self parking is available onsite. 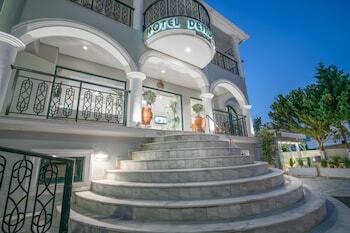 Located in Kefalonia, Paspalis Hotel is a 1-minute drive from Skala Beach and 9 minutes from Kaminia Beach. The front desk is staffed during limited hours. Free self parking is available onsite.